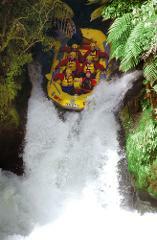 Raft the Mighty Kaituna River, snake through New Zealand Native bush clad canyons, through 14 rapids, 3 waterfalls including 7m Tutea falls - the worls largest commercially rafted waterfall! 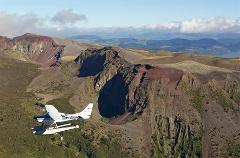 Iconic Mt Tarawera is infamous for its eruption on June 10th, 1886. Mt Tarawera created the world’s youngest geothermal valley of Waimangu, at the same time destroying the legendary Pink and White Terraces. 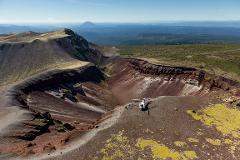 Travel to Mt Tarawera with Volcanic Air by Helicopter then be greeted by Kaitiaki Adventures at the Summit of the Mountain to experience the Volcanic Crater Hike. Raft over 14 awesome rapids & 3 Waterfalls, then take the river on at Eye level for an intimate trip through the Native bush propelled by the flippers on your feet! 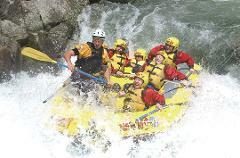 The ultimate in rafting in New Zealand the Wairoa is a full on Grade Five river open 26 days a year. 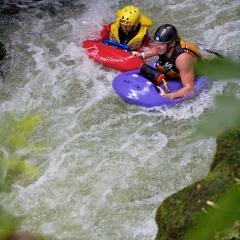 A stunning boulder and tree lined gorge combining turbulent rapids with exciting drops to produce awesome white water action. 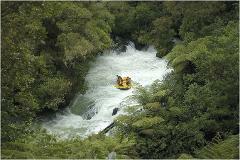 Raft down 14 Rapids and over 3 waterfalls including the highest commercially rafted waterfall in the world! 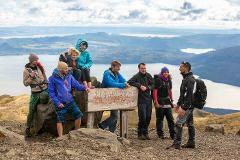 & hike to the summit of Majestic Mt Tarawera. Awesome or Culturally infused adventures! This beautiful Grade 4 river is perfect for first time rafters and thrill seekers alike. There is something for everyone on this beautiful scenic excursion. Play holes and awesome rapids to negotiate your way through as you are in charge of your own vessel. Take the river on at eye level!